Today’s post is simple, silly and will make you think about something that gives any sane person a shiver of abject horror; Tommy Wiseau’s film, The Room. The Room is possibly the worst movie ever… well I hesitate to use and thus desecrate the word “created.” “Spewed forth into the world” is more accurate. If you’ve seen it, the list of things that are wrong with you clearly begins with being frighteningly masochistic. If you haven’t seen it, don’t. I confess that I myself have viewed only clips and trailers, and that was enough. My foolish boyfriend and his pals watched it, though, and from what I hear, even Rifftrax can’t help this movie. There’s a generally known, dating-back-to-I-don’t-know-when-but-let’s-randomly-guess-the-60s craft out there, wherein you make a little treat container by sewing together two paper shapes, filling the space between with goodies, and stitching up the gap. 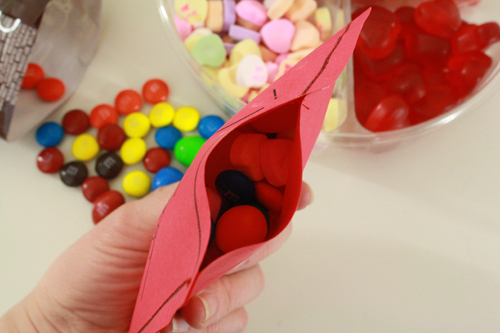 So, for example, paper hearts can make a sweet little Valentine’s parcel full of candy. 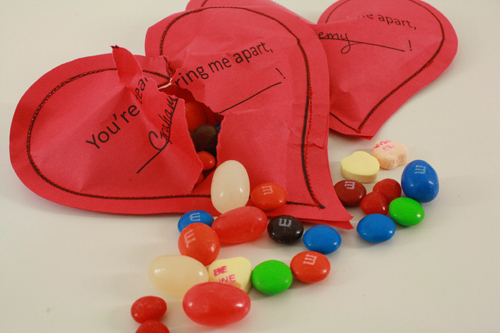 The candy can only be obtained by ripping apart the paper, making it a one-use-only kind of craft. The most heavily quoted line from the film (at least amongst the folks I know) is “You’re tearing me apart, Lisa!” Imagine it delivered with an stupefying amount of stilted and unbelievable angst, spoken by a man whose lack of acting skills are clearly only surpassed by his lack of screenwriting and directing skills. Imagine how Robert Pattison would deliver such a line, and then imagine it being several times worse. Yeah. 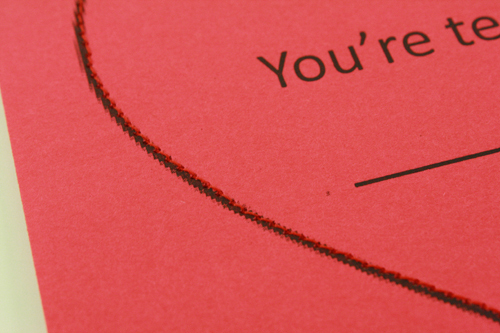 So this is a Valentine either for friends who share your Wiseau-mocking brand of humor, or perhaps for your worst enemies (in which case it should be given to them along with a DVD copy of The Room). 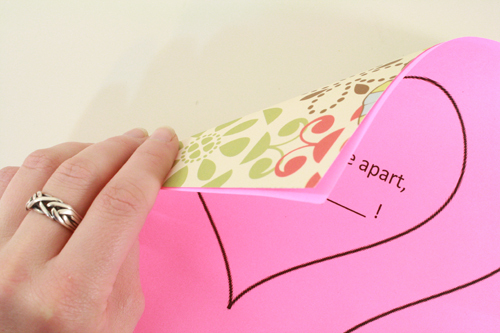 1) First, print out the template on some sort of coloured or pretty (or, if you prefer, plain or even really ugly) paper. As noted above, the paper shouldn’t be thicker than standard printer paper. 2) Match up another piece of paper behind the first. It can be the same colour, or not. I decided to use some pretty patterned paper on the back of several of my packets. 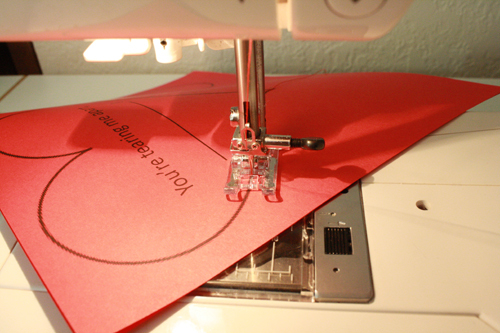 3) Start at the bottom pointy bit and stitch around the heart, sewing right on top of the black line. * Remember to backstitch at the beginning so that your thread knots, and use medium length stitches – if you use very small stitches they’ll be so close together that the paper will be quite fragile and more likely to tear than to hold together, since what you’re essentially doing is punching little holes in it with the needle. 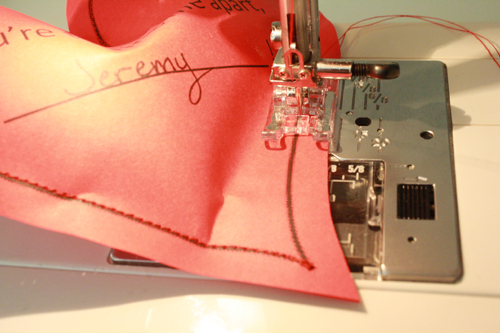 Stop stitching when you’re about 2 or 3 inches away from getting back to where you started. Backstitch again to knot the thread, then cut it. 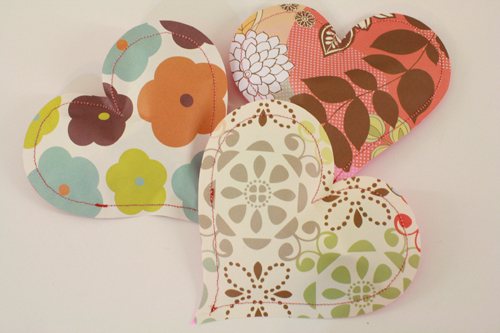 *The sewing can also be done by hand. Be sure to follow the same advice about using medium sized stitches, and be careful when knotting your thread that you don’t pull on it too hard and tear the paper. 4) Cut all the way around the heart, about 1/4 inch from the stitches. 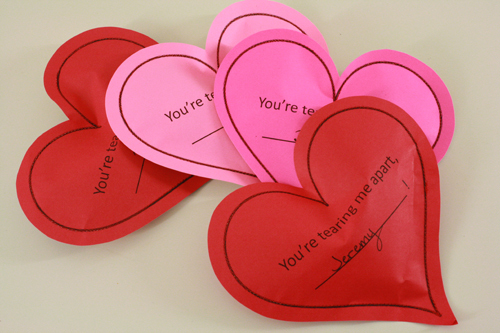 5) Write the recipient’s name on the heart. 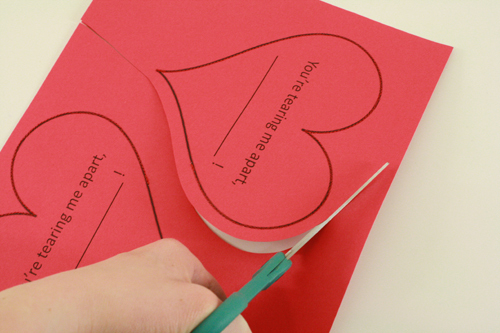 You can do this earlier on, too, just be sure to fill it in before you stuff the heart with candy, after which it will be difficult to write neatly on the paper since it will be all bulgy and uneven. 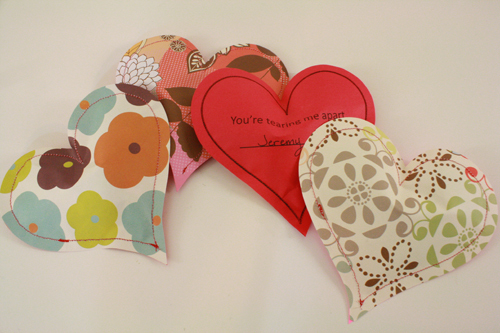 6) Carefully use the unsewn side of the heart to reach in and push the two sides of paper away from each other, making a little pocket inside. Fill with candy. Not too full, though, or you won’t be able to close it back up again. 7) Return to the sewing machine, and stitch the gap on the side of the heart closed, remembering to knot the thread at start and finish. Trim the thread, and you’re done. 8) Present to your friends/enemies! And speaking of the joys of irreverently wonderful Valentines, check out this rainbow-pooping unicorn card over at handmakemyday.com. I like this gal! god… what a terrible movie. my boyfriend LOVES it and says when it comes out on blu ray soon, he’s buying it. 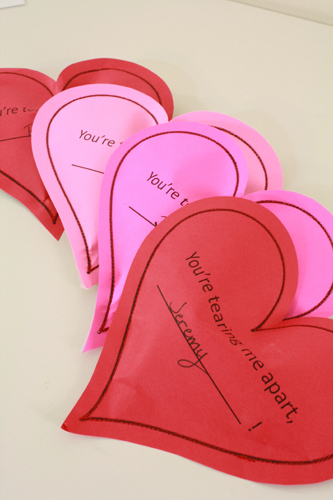 i HATE it and he is now watching clips on youtube… maybe i should make him one of these hearts? lol. Too funny. 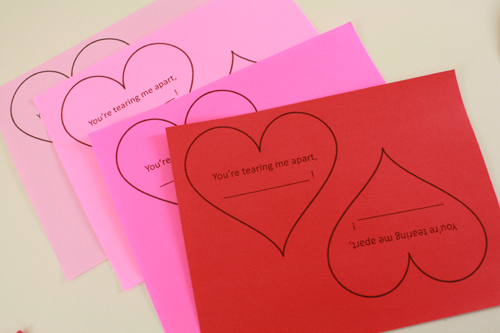 Unfortunately, nobody I would be giving Valentine’s candy to would understand the joke (I can’t decide what kind of friends this means I have), so there would be little point in making these candy packets. However, I like the idea and may have to find other uses for it. Jenn, I think you should make him several! Perhaps opening them will distract him while you destroy his DVD copy with a sledgehammer. Or fire. Whatever works best. Robyn, I’m thinking it says good things about your friends, even if it means a disappointing lack of people around you getting the joke. Those of us who know about his film have to find ways of working through the pain, but our lives would doubtless be better if we’d been left in Wiseau-related ignorance. I commend any movie related crafts no matter how bad the movie. Bravo!